With the slowest of jazz music playing – image number 3. Umbrellas. Why do they look so good in photographs? I imagine it is the shape and form. Or maybe they bring us back to our childhood and Mary Poppins. The magic of umbrellas. Open them up and off you fly up and away. The third in this series was taken just outside the market place. I must have appeared a little strange to those who saw me. This strange foreigner with a shower cap over his camera taking photographs of people in the rain. Very often when you take someone’s photograph on the street, their first reaction is to look around them. They experience curiosity and surprise as to why you would want to take their photograph. Some photographers will say that they avoid making eye contact with people after they shoot, that they just move on, but at times I like to make contact if I can. People usually respond well. In Korea, without a common language, showing the image you have taken of a person or group is fun. I hold the camera for them and let them see their shot. Invariably, with a little nervous laughter and smiles they will say something and I will respond with my very limited Korean. More laughter will ensue and then a little silent moment of us both looking at the image together. Then we exchange nods or bows and leave. The iPhone photograph is a fun one today. I was out for a walk, listening to a podcast when I saw this cool looking dude on a yellow moped driving up and down the street. He was having a little joyride for himself. Enjoying the sunshine and the cool breeze. Koreans love to wear hiking gear, bright, colourful hiking gear. This guy’s orange jacket was such a fine match for his yellow moped. He passed me. I was not ready for the shot. But at the bottom of the street he turned again and I stopped. Stopped opposite this bright yellow warehouse. And I waited. Camera ready. He drove past. I clicked and was lucky. Not sure why he was zipping up and down the road on a yellow moped. 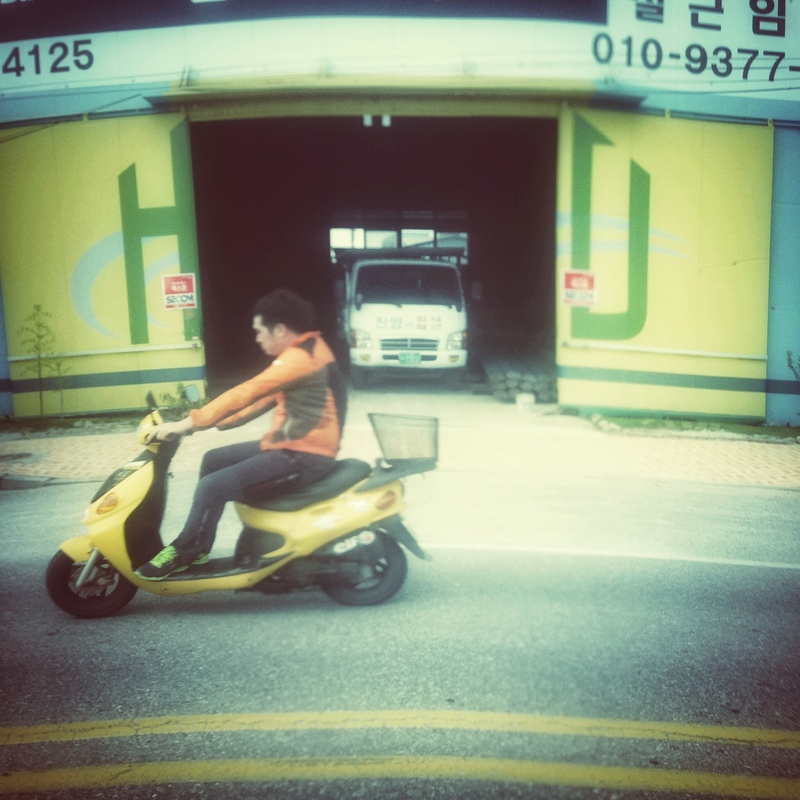 Not sure why Koreans, who are normally so obedient, do not wear helmets when riding motorbikes or mopeds. Maybe this guy was rehearsing his getaway. 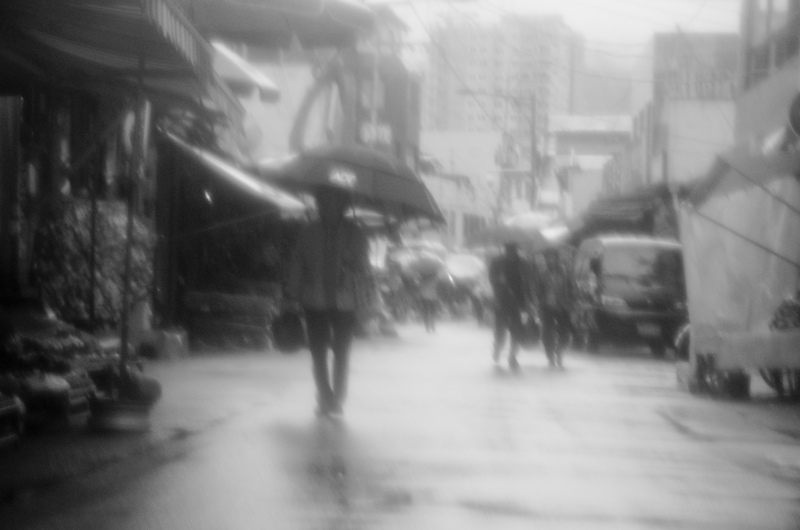 This entry was posted in Daily posts to Flickr, iPhone, Street Photography and tagged blur, blur art, blur photography, Brendan Ó Sé, iPhone, iphoneography, Korea, learning, love, mobile photography, mopeds, people, street photography, umbrellas.